A new technology invented at the University of Arizona offers a positive environmental impact by slowing the evaporation of water from bodies of water such as mining tailings ponds and reservoirs, while simultaneously generating solar energy. 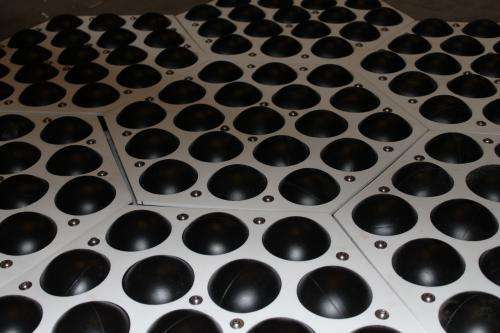 The invention, called Hexocover, consists of floating hexagonal plastic panels that sandwich 4-inch balls linked together to form a cover to prevent evaporation. The panel design addresses the need for mobility through the inclusion of a propulsion system as well as GPS, so the panels can be built to be remotely configurable. Further, when configured with solar cells, the panels can generate electricity. The cover minimizes water evaporation, the high cost to replace that water and mine energy costs. And, in the end, it minimizes the overall environmental impact of such operations. With such features, the market possibilities grew to address similar needs for other types of bodies of water, such as reservoirs and swimming pools. Developed by Moe Momayez in the Department of Mining and Geological Engineeering in the UA College of Engineering and Nathan Barba, managing partner at RePower Design, Hexocover is the result of their effort to find ways to conserve water in mining tailings (remediation) ponds. The company worked with Tech Launch Arizona, the unit of the UA that commercializes inventions emanating from University research, to execute an exclusive license to bring the invention to market. The license grants RePower Design the sole right to commercialize the technology, which includes both the floating panel design as well as the solar panel integration. The company already has begun developing products based on the patent, which Tech Launch Arizona filed on behalf of the UA in the summer of 2014. According to Barba, Tucson has an evaporation rate of 109 inches per year. Water in storage facilities such as tailings ponds and reservoirs always needs replenishment. "We needed a way to prevent the evaporation of (tailing pond) water, but we needed a system that could move out of the way when the tailings are being released into the ponds," Barba says. "If we can cover them, we can help with the devastating water shortage problem here in the southwestern U.S. and around the world." A system was needed that would allow wind and rain to freely pass through. For the past seven years, Momayez has been investigating the integration of photovoltaic, or PV, panel deployment with mining land reclamation processes, mining-specific environmental effects on PV output efficiency, and geotechnical considerations related to the installation of panels on tailing slopes. "The PV work on reclaimed mining lands has gained national recognition," Momayez says, "and the idea to control the evaporation of the supernatant water accumulating in the middle of tailing storage facilities was a natural extension of my research and a huge step forward to save water in arid climates worldwide." "For someone who owns a water reservoir, like a mine or municipality, this invention provides a dual benefit and a dual revenue stream," Barba says. "Water conservation is a societal imperative, not just in the Southwest, but around the globe," says Doug Hockstad, director of technology transfer at Tech Launch Arizona. "Technologies like this will help save water, especially in arid environments. Since the University of Arizona has such a strong research history in this area, it's exciting to see that research having a social and economic impact." "I'm most excited about the possibilities of fixing a big problem," Barba says. "It's been interesting to have this original challenge, and then see it develop and get refined and perfected, and now to see it working." Seed funding for Momayez's evaporation control project was provided by the UA Renewable Energy Network. UA REN director Ardeth Barnhart said of the project: "Mining activity typically requires a lot of energy, and this technology is a great example of how original ideas that develop the use of solar energy to transform industrial processes can have immediate and transformative effects on water and energy use, create positive environmental impact, and provide direct benefits to our economy." This idea - in the form of free-floating plastic balls with ribs to prevent rotation (which would make them less effective by increasing evaporation) - has been in use in UK , Europe and elsewhere for "donkeys' years" - that is: more than 50 to my knowledge. I only see a cost disadvantage in trapping the balls in an expensive engineered frame, unless the frame is used to support power-generating solar panels. Good way to stop birds from landing in them too. Uh, yeah, nothing like covering a reservoir or swimming pool with one of these plastic mats to turn it into a soup of nasty, plastic-derived VOCs of the carcinogenic, cytotoxic, endocrine disrupting kind. I'm sure Public Utilities water customers, as well as the rest of the affected biosphere, will appreciate this(apparently quite hoary) new technology. One should always bear in mind that there are very few things in the world that can be permanently improved via the application of thermoplastics. That has to be one of the most ridiculously over engineered designs to do such a simple job I have ever seen. I really don't understand why they bothered to patent it. It's a major waste of money when it could easily be done for a fraction of those contraptions will cost. Caliban, you have a very valid point there about the chemicals that would leach out of the plastics too.